Centrally located in the heart of jackson this newly renovated boutique motel is close to everything this town has to offer. 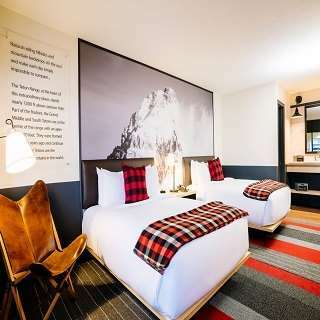 Located just 3 blocks from the jackson town square the mountain 5 blocks from snow king mountain 10 miles from grand teton national park 12 miles from jackson hole mountain resort and 55 miles from south entrance of yellowstone national park. Ocean City China Bistro: Ocean City China Bistro offers delicious dining and takeout. It is known for its modern interpretation of classic dishes and its insistence on only using high-quality fresh ingredients. The hotel is within 13 miles of Grand Teton National Park and Jackson Hole Mountain Resort. Yellowstone National Park is just 60 miles away. The property is within walking distance to many local shops restaurants bars and galleries. Grand Teton National ParkFeatures mountains waterfalls rivers and lakes that allow for hiking biking climbing boating nordic skiing snowshoeing and wildlife viewing opportunities along the Teton Mountain range. Jackson Hole Mountain ResortA ski resort featuring the longest continuous vertical rise of any ski area in the U.S. rising 4139 feet from the valley floor to the top of Rendezvous Mountain. Jackson Hole Shoot OutA free outdoor gunshow presented by the Shoot Out Gang. Fun for families and held nightly from Memorial Day through Labor Day. National Museum of Wildlife ArtA world-class art museum holding more than 5000 artworks representing wild animals from around the world. Snake River Rafting And Float TripsWhitewater rafting and scenic float trips along the Snake River available in Grand Teton National Park and the Grand Canyon of the Snake River. Snow King Mountain ResortA ski resort with 32 runs over 400 acres two terrain parks and 1571 ft of vertical gain rising to 7808 ft.
Yellowstone National ParkFeatures mountains geysers waterfalls rivers and lakes that allow for hiking biking climbing boating nordic skiing snowmobiling and wildlife viewing opportunities in America first national park. Center for the ArtsA hub for the artistic cultural and creative activity in Jackson Hole. Town SquareThe cultural civic and mercantile heart of the town of Jackson. The park entrances are adorned with large arches made from elk antler sheds and is surrounded by restaurants art galleries and retail shops.